To create a fun, engaging, and interactive experience for our young visitors, to allow them to experience something of Australia’s history. 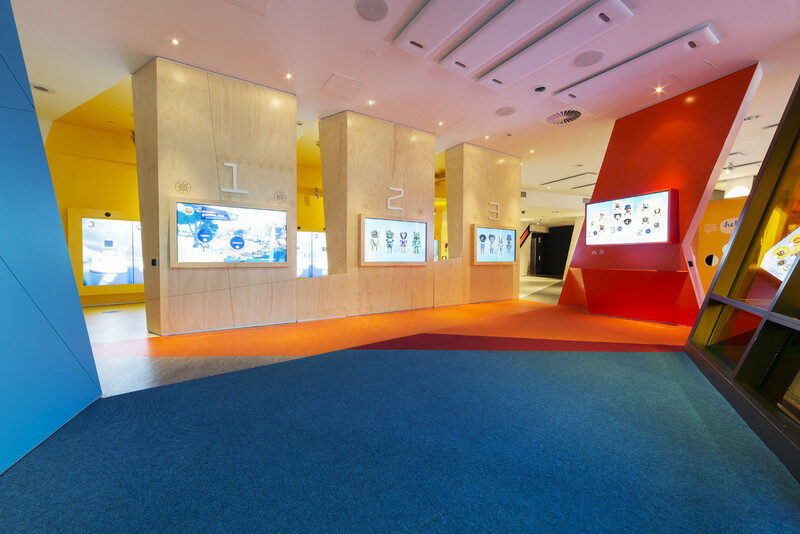 In 2012, the National Museum of Australia set out to redevelop its children’s area ‘Kspace’ into an entirely new digital experience – one that is more up-to-date and interactive, and more closely related to the themes and ideas explored at the Museum. The much awaited Kspace is now open and so far it has been a hit with kids, parents and teachers alike. Kspace is a time-travelling interactive adventure game for kids aged 5-12. Kids design time-travelling robots and blast back in time to Australia’s past to complete a mission unique to that time and place. 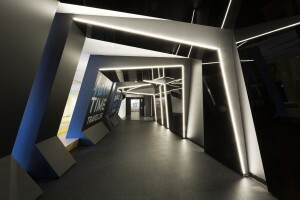 Children begin their journey when they walk down the time-tunnel ramp into the main Kspace area, which is bright, welcoming and playful. There, they team up in a group of up to four, and begin the first stage of the experience: designing a time-travelling robot on a 55-inch touchscreen. 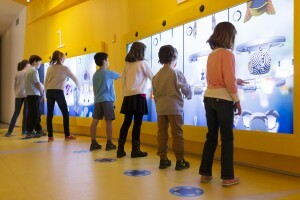 After designing their robots, children move into the core part of the experience: the Time Pods. There, ‘KC’, the Kspace Computer, teaches them how to use the controls to move around the space. Then the exciting part begins: they’re blasted back in time to one of eight mystery locations in Australia’s past. These locations include the Victorian goldfields in 1854, the Sydney Harbour Bridge under construction in 1930 and the Royal Adelaide Show in 1968. When kids arrive in the Time Pods they embark on a mission in the form of a series of games. There are two styles of gameplay. The first of these are mini-games where kids use the robot they designed in the earlier stage to complete specific tasks. In the second gameplay style, children combine to form one big robot (called the ‘Mech’). Each player controls a different part of the Mech: its legs, head or arms. They have a first-person view of the world and are able to interact with and collect objects by taking photographs or using equipment. The Mech mode encourages collaboration between the players and rewards children for exploring the scene and taking notice of things around them. For example, for the 1968 Royal Adelaide Agricultural Show game, when kids first arrive in the scene they find themselves inside an animal enclosure. A young girl is caring for the animals when some lambs escape from their pen. Kids must find their way out of the animal enclosure and help her find the lambs to get them to their mother in the main arena. In the process of doing this kids get to complete exciting games and rides in sideshow alley, interact with animals, and take photos of things in the scene that may be different from what they see today, such as clothing, hair styles and cars. The final stage of the Kspace experience is the Cool-down area, which allows kids to find out more about the key themes explored in the scene they just visited. They can also view video clips, read about relevant objects from the Museum’s collection, and email home a postcard from their journey. There is also space available for educator-guided programs. Kspace allows kids to engage with Australian history in a fun and interactive way. Kspace puts kids in control of their experience, they create their own robot and control what they do when they arrive in the scene. Kspace is a collaborative game which encourages team work: the more kids work together the more “Kstars” they’ll collect. Kspace encourages kids to look closely and notice the things that are different in the scene from what they see today. 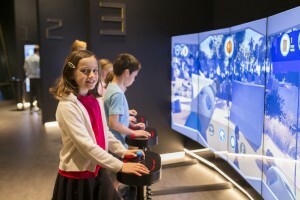 Kspace puts kids in the picture – literally – by having their photo taken and superimposed upon their robot design, this robot is then used in each of the scenes to complete a series of mini-games. Kspace is different every time kids visit: they may travel to a different place (there are eight possible scenes), and even if they travel to the same place the real-timing gaming environment means that what they experience each time will change. This helps to encourage repeat visitation to Kspace. An important part of the Kspace redevelopment project was involving audiences – and in particular kids — throughout the development process, from concept stage through to delivery, to ensure that what we were creating met the needs of these audiences. This included helping brainstorm concepts for Kspace, providing feedback on the game world designs, prototype testing and then testing beta versions of each of the scenes. The Kspace application is custom built. The games are developed using the game engine Unity. The backend is a Ruby on Rails application running on LINUX Ubuntu. The Cool-down area is an HTML5 website with a custom CMS. The Kspace software integrates with the Museum’s lighting and hardware control systems. The Design Station uses face detection software to pick up the faces of visitors at different heights. The Time Pod controllers are mounted on actuators which allow the controllers to be positioned at three different heights, accommodating taller adults and smaller children. Kspace has a range of options for visitors with hearing or physical impairments, including augmented hearing units, portable accessible controllers and a set of printed ‘visitor access guides’ which can be used by those with a hearing impairment or learning difficulties. When choosing the scenes to be included in Kspace, our criteria were that they should allow for fun and engaging gameplay, and there should be strong connections to the Museum’s themes and collection as well as to the Australian history curriculum. It was also important that there be a diversity of stories, time periods, places and people across each of the scenes. Substantial research went into creating the scenes (the landscapes, clothing, characters and objects) as well as the Cool-down area and web material emerging from them. A full-time curator worked on the project to research material for the scene narratives and graphical elements, and to QA the scenes for historical accuracy and appropriateness. You can also check out the Kspace website which includes extensive teacher and student support materials linked to the Australian curriculum to help students prepare for, and reflect on, their visit to Kspace: http://www.nma.gov.au/kspace.